The laser treatment for psoriasis or Light therapy also known as phototherapy involves exposing the skin to limited amounts of ultraviolet light (UV) light under medical supervision. Treatment is done in a doctor’s office or a specialized psoriasis clinic or sometimes even at home if a patient has a phototherapy unit. The main key to success with this system is being consistent. The National Psoriasis Foundation doesn’t support patients making use of indoor tanning beds for treatment in place of going to a certified medical establishment to have the session don under a medical doctor’s supervision. UVB is also present in natural light found from the sun and is an effective treatment for psoriasis. UVB gets into the skin and slows down the growth of the affected skin cells. Treatment involves sessions exposing the skin to artificially generated UVB light for a certain amount of time based on a schedule that a doctor recommends. The treatment is then administered in a controlled environment. There are 2 types of UVB treatment, narrow band and broad band. The main difference between them is that in narrow band treatment, the UVB bulbs are set to release a smaller range of UV rays. However, narrow band and broad band UVB have many similarities. Studies have shown that narrow band UVB treatment clears psoriasis much faster and produces remissions for longer periods than broad band UVB. It is also effective with fewer treatments each week. When going to the UVB treatment for the first time, the psoriasis may worsen before it improves. The skin sometimes reddens and itches from exposure to the UV rays. To avoid further irritating the skin, you may need to reduce the amount of UVB rays you are exposed to. The occasional flares may show up but they are temporary. The UVB can be combined with other systematic or topical agents to increase its efficiency but in some cases it may increase the skin’s sensitivity to light or even shorten remission periods. However, using a combination of UVB and systemic therapy may increase its efficacy and allow for much lower doses of the systemic drugs to be used. Treating psoriasis at home using UVB light is an economical way to go about it and convenient as well. Just like when done in a clinic, it requires having a consistency. Patients are first treated in a clinic before being advised on how to go about it at home. When doing it at home, always ensure that you follow the doctor’s instructions and continue with your checkups with him/her. Even at home, you still need to be monitored for any changes in your psoriasis. All the phototherapy sessions, including the buying of the equipment for use at home, need a prescription from your doctor. Your insurance provider may cover the cost of buying the equipment so you can look into it. Many of the vendors who sell this equipment will work with your insurance provider to help smoothen the process. Both UVA and UVB are found in sunlight but UVB works best when it comes to treating psoriasis. The UVB that comes from the sun works in the same way as the artificially generated UVB. Sunbathing is recommended for psoriasis treatments as long as they are careful not to get sunburn. You can start with short periods of sun exposure then gradually increase them if your skin tolerates it. To get the most out of this, ensure that the affected areas receive an equal amount of exposure and remember to always wear sunscreen on the areas affected by psoriasis. It may take a while but you will see improvements. Some topical treatments can increase the risk of sunburn. These include; coal tar, tazarotene, protopic and Elidel. When using these products, consult a doctor before turning to the sun. Generally, if you are under light therapy, you should avoid too much exposure to sunlight. Another form of laser treatment for psoriasis is UVA and just like UVB it is also present in sunlight. UVA is relatively inefficient unless when it’s used together with psoralen (a skin light sensitizing drug). This can be taken either orally or topically. PUVA slows down excessive cell growth and does clear psoriasis symptoms for certain periods of time. 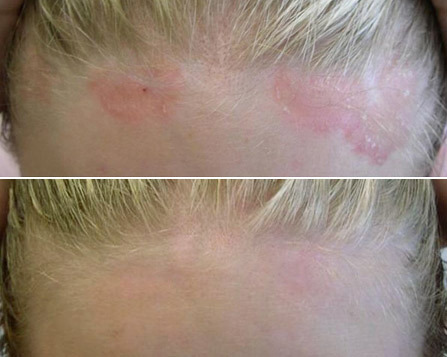 Guttate psoriasis, plaque psoriasis and psoriasis found in the soles and psalms are more responsive to this form of treatment. Short term side effects related to PUVA include itching, nausea and skin redness. To take care of the nausea, you can take ginger supplements, drink milk or some ginger ale. To relieve the itching, you can bath with colloidal oatmeal products and you can reduce the swelling from standing during the treatment by wearing support hose. This was only recently approved by the FDA and it’s used in treating chronic, localized psoriasis plaques. It emits a high intensity UVB light beam. The laser can target specific areas on the skin and response to the treatment varies from individual to individual. It may take anything between 4-10 sessions to see any changes depending on the type of psoriasis. 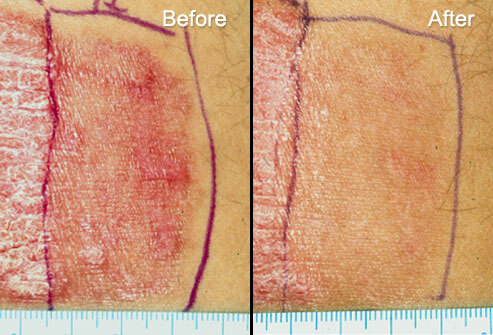 Just like the excimer laser, it is approved for the treatment of chronic, localized psoriasis plaques. The laser destroys tiny blood vessels that contribute to the development of psoriasis lesions using UVB light. The number of sessions and response to the treatment also varies from one patient to the next. Some patients turn to tanning salons as alternatives to natural sunlight. The tanning beds found in most tanning salons employ the use of UVA light. Remember, psoriasis responds much better to UVB light. The psoriasis foundation discourages the use of tanning beds as substitutes for phototherapy sessions conducted under medical supervision. The FDA and the American Academy of Dermatology also discourage the use of sun lamps and tanning beds. The UV radiation from these units may damage the skin further aggravating the psoriasis. Any form of laser treatment for psoriasis should be done under strict medical supervision.